Hypurrthyroid Treatment for Cats began offering radioiodine services for cats with hyperthyroidism in February of 2017. We provide state-of-the-art treatment for our patients in a warm, comfortable environment that has the emotional and physical well-being of every single patient at the forefront. We love cats, and we are especially fond of senior and geriatric cats, the cats most susceptible to developing hyperthyroidism. We know that cats prefer not to be away from home – our own included. 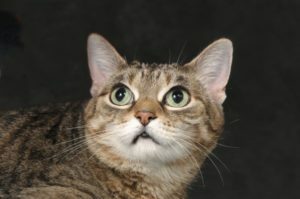 We are your hyperthyroid cat’s best friend and it shows in every bit of detail and personalization taken into consideration for each patient under our care for treatment in our facility. 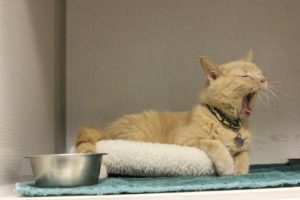 Our hyperthyroid patients are housed in spacious, quiet cages, with cushioned padding, hiding cubbies, and all the attention that they want (or don’t want) – we respect their preference. Dr. Colleen Currigan is the owner of Hypurrthyroid Treatment for Cats. She and her colleagues at Cat Hospital of Chicago, Drs. Daphne Thompson, Elizabeth Czerwonky and Mariah Foose all take part in the care and treatment of our patients receiving radioiodine treatment. Our staff of individuals all excel in gentle cat-friendly patient handling and care and they work hard to support our veterinarians to assure all hyperthyroid cats receive individualized care. Our treatment center is closely regulated by the Illinois Emergency Management Agency and the Federal Nuclear Regulatory Commision. Our Radiation Safety Officer and Radiation Physicist make quarterly visits to our treatment center to assure that we are current with all radiation safety measures – for our patients, our ‘human team’, and our patient’s owners.